May 23, 2012 18 comments on "1982 “Ferrari Red” Bianchi"
This weekend I became the owner of this 1982 Bianchi. As soon as I saw it I knew it needed the right home. I have not determined the exact model yet. However, I have a suspicion that it might have been either a custom build, do to the fact that it’s forks are chrome, or a Bianchi Sport SS. From all my research it appears that stock Bianchi forks would have probably been the same color of the bike. It has full Shimano Golden Arrow components, the predecessor to the Shimano 105 components. These components were available from 1983-86, but Bianchi released them with their 1982 Sport SS Road Bikes. So it’s very possible that this bike is a Bianchi Sport SS. One thing that is confusing is the “Red Ferrari” color. It was a limited color, which is one of the other reasons I believe it might have been a custom order at the time. Visually, it is a beautiful bike and rides very well. I have taken it out on some nice rides since getting it and I am shocked at how well it feels. For being 30 years old the frame and components feel amazing. It shifts really nicely and it feels light pedalling up hills. I have an early 1980s Benotto which I am restoring and the Bianchi’s frame geometry looks almost identical. Which is another confusing matter. The Benotto frame is highly regarded for its geometry. Right now I am really enjoying this beautiful bike. If you know anything more about this bike, or if this page helped you identify yours, I would love to hear it. I replaced the bar tape with some nice comfy yellow Specialized tape. I am looking for some brake hoods to replace these, but in the meantime, electrical tape holds them together nicely. Ambrossio 19 Extra rims. I really like these rims. I have a set of Mavic’s too, but I prefer these. 18 Comments on "1982 “Ferrari Red” Bianchi"
I have what seems to be the same bike but it is fitted with Campy super sport derailer and gear shifts and straight red forks. I bought it second hand back in the late 80’s from a starving student who worked in a bike shop. I’m wondering if the student switched out the Japanese components and fitted Italian?? Did any of these Ishiwata limited 022’s come stocked with Italian components or only Japanese? Hi John, it’s possible. It was common for people to customize them right out of the shop when they first purchased it. It’s a very nice frame. Thanks for posting this Bianchi info and pics. I’ve got one in Ferrari red only mine has a CrMo sticker and presumably Italian tubing (based on the “tubi rinforzati” sticker) and a mix of Japanese parts: Suntour derailleurs, SR cranks, Dia Compe brakes, etc. I’d guess the frame and bike was assembled was made in Japan. Just wanted to add some info to thread. Great blog btw. I like the violin story! Hi Markus, thanks for sharing about your Bianchi, sounds like a really nice bike! This model is one of my favourite classic bikes I’ve ridden. Mine is of the same era, and like Ryan’s, mine has the chrome rear stays as well as the lower half of the fork. The fork is stamped with the ishiwata name. I just stripped it down for paint as the chips are rusting on the main tubing. But I have to say, the chrome on the fork is amazingly fresh, even after thousands of miles. I rode mine in NYC for years, then converted it into a single speed with just a front brake. It’s so spindly, it’s like riding a gazelle. I am going to have it painted silver, with the lugs red, to remind me of what the paint once was. it has no more decals, no original components, which I believe were sun tour and dia compe brakes. My seat post is fused to the seat, and that’s torn. It need some tlc and I am giving it to her. The next iteration is a flip flop rear hub, single speed, deep vee velocity rims, bull horns and all components will be black. It will be stored indoors and used to ride between buildings at work. I’ll be passing this one down to my children. Thanks for the info on the manga frame. Awesome, sounds like it will be a thing of beauty when you’re done with it. Be sure to post a link to a pic when done. im eyeing a vintage bike and i come across one whos selling a Bianchi. It rides pretty good. but i didnt bought it yet because i want to do a research first about the bike. Good luck with your search. Let me know how it goes. 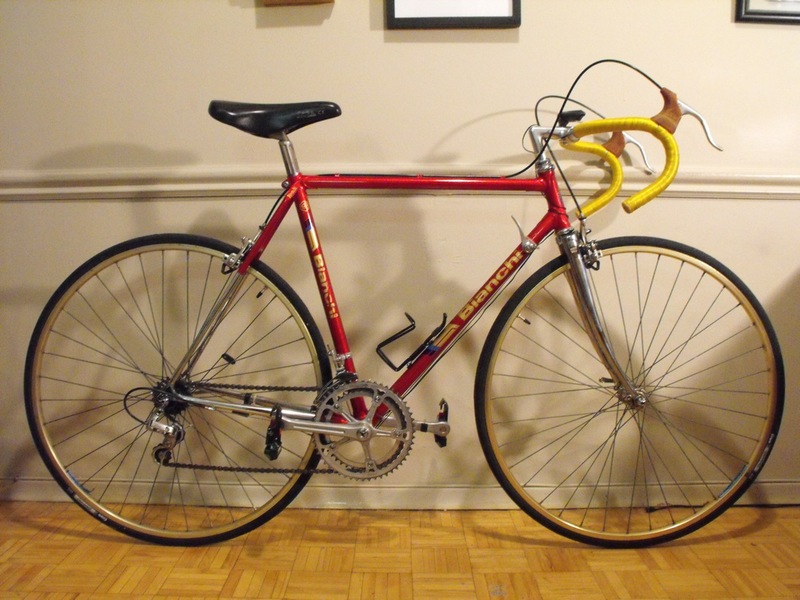 Anyhow – I stumbled on your blog as I was trying to google info on ‘Magny Ishiwata’ frames as I’m selling my ’83 Bianchi on Kijiji…just read about your ‘red ferrari’ Bianchi and hoping you can tell me if this is a ‘good’ thing or is the ideal Bianchi 100% bike parts made in Italy? Mine is in MINT condition & trying to sell it to a WORTHY new owner. Mine’s been stored indoors forever (i.e. ’83…). My friend & I each bought a Bianchi intent on doing some serious riding back then, it never panned out. Hence my MINT bike…as it is a ‘beautiful looking’ bike it’s kinda hard to let go…that’s why I want it to go to a deserving new home who will take care of it but also be finally enjoyed. So, I wish to be better informed if someone tries to minimize its value (for better price) or ask me questions about it….it appears from what you wrote that the Ishiwata tube frame does not DEVALUE the Bianchi brand – is this correct assumption?? Thanks for your kind words. For some collectors the ideal Bianchi is made in Italy. It used to be because of the Italian Chromoly frames, but over the years the quality of the Magny Ishiwata frames has proven to be very good and so the street value of the Magny Ishiwata Bianchi frames is getting closer to that of the Chromoly frames for collectors. If someone is buying it for an everyday rider then the fact that it’s an Magny Ishiwata might be considered a good thing as it is a very good frame to ride on. Hope that helps. I have the same bike, with the shimano components too, however mine is electrical blue, and looks a little older than yours. Hi, I have a bianchi mangy from that time period. About how much do you think these bikes are worth? It depends on the condition of the bike, but I’ve seen these prices vary. A fair estimate is around $225, but I have seen people ask $100 to $375. It really depends on what people are willing to pay for it. It’s a nice bike to ride, so people are usually looking for one in good condition with good tires and components. I just picked up this exact bike today after falling in love with it on craigslist. I’ve been trying to identify it as well and your post has really helped! Mine doesn’t have the shimano components to it though but the frame and chrome forks match exactly. I really like it too. The geometry of the frame is really nice. What components are on your frame? Mine has Suntour Cyclone MK-II front and rear derailleurs with NGC brakes. It does have the same Ishawata frame as yours. After reading a bit more about the parts I’m coming to suspect that mine is a Sport SS model from probably 1984 or so (This is apparently when Bianchi started using the MK-II components). Another thing that differs from ours is that I noticed that your seat and chainstays are full red; mine are almost full chrome sans the matching red on the seatstay. As you’ve also said, this bike rides beautifully. It takes to about anything with ease and efficiency. Brilliant, you have a beautiful bike there. ryan, how much did you paid for your bianchi bike?